One of the dishes that can not be missed in a tavern in Madrid are the “broken” or “crashed” eggs. It is a traditional dish that, of course, can not hide its Spanish origin in any way. In fact it was very common in the most humble social classes, but given its exquisiteness it soon spread to all levels. The base of this dishes are eggs and potatoes and, if you could, meat from the pork slaughter was added to make the dish much tastier. Currently, “chistorra” (a type of red sausage) and prosciutto are usually used, and it is also usually accompanied with peppers. Obviously, the fundamental element of the dish is the fried eggs, and although it does not look like it, this has a long history. It is believed that this custom appears at the same time that the hens begin to be domesticated, in India and in ancient Egypt. Apparently it was the Phoenicians who made it possible to cook the first fried egg, since they traded in olive oil, then an indispensable component. Thus, it is estimated that the first fried egg was cooked by the year 1000 BC. The first written reference on this delicacy was the Arab philosopher Averroes, who pointed out that to fry an egg well you had to use a lot of olive oil with low acidity. 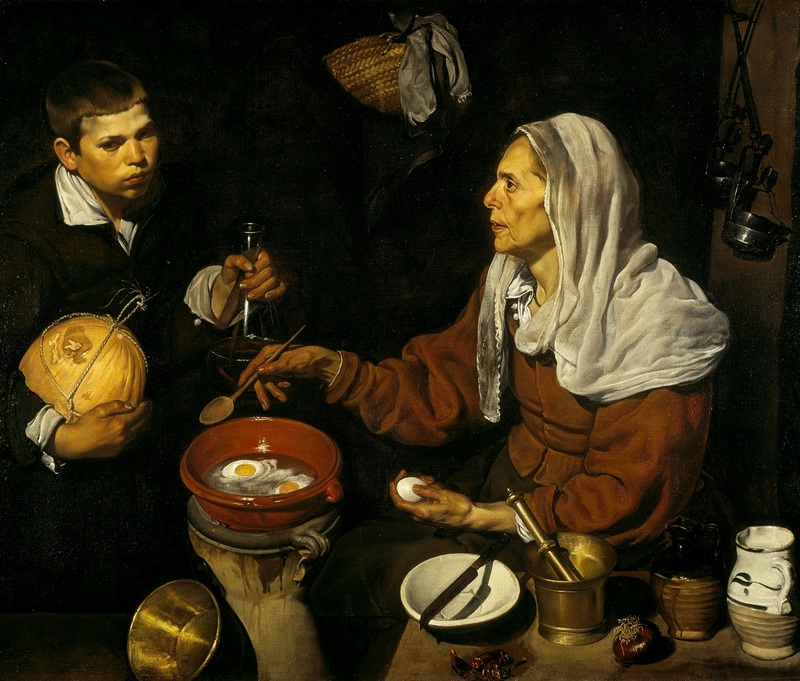 In addition, we have an excellent visual reference of 1,618 thanks to our universal painter Diego Velázquez, in his work “Vieja Friendo huevos”. It must have been around that time when broken eggs appeared as we know them now, thanks to the popularization of the potato that had come from America years before. But it was not until 1846 when the Hispanist Richard Ford, in his work “Gathering from Spain” already spoke of this dish as one of the most basic in the humble Spanish classes. But this is only a theory. So, the best you can do it is to try them in El Anciano Rey de los Vinos. Here we continue making them in the traditional way. So when are you coming?